Companies are doubling down on the expansion of talent communities to find the best hires. Ask Amy Sparling, senior talent acquisition manager at West Monroe Partners, if she believes in talent communities and she will not only say yes, but she will offer up some impressive numbers to bolster her case. For example, Sparling reports that West Monroe Partners, a national business- and technology-consulting firm based in Chicago with just over 1,000 employees, had nine hires in 2017 that resulted from strategic partnerships and programs. That would include the Jumpstart program, which connects STEM graduates with employers, and the Grace Hopper Celebration of Women in Computing, a series of conferences designed to bring the research and career interests of women in computing to the forefront. West Monroe also connects with talent via on-campus associations, including Women in Business. Also last year, West Monroe Partners saw a 42 percent growth in new company followers on LinkedIn as a result of its talent-branding initiatives and digital campaigns, and a 46 percent increase in inbound applications. Finally, 34 percent of West Monroe’s hires are sourced through employee referrals, which Sparling says her company continues to stress. In fact, it recently rolled out a new referral program to continue to drive awareness around their importance. “Staying connected with our talent communities, regardless of whether there’s an immediate need for their expertise or not, helps to ensure our talent-acquisition team has a pulse on the market and is tapping into our already-existing network before going back to the drawing board for each search,” Sparling explains. She adds that West Monroe is fortunate to have employees who are engaged in hiring the best and brightest for the firm, which means they’re regularly networking with ambitious candidates and socializing them with the company’s hiring stakeholders. Jason Weingarten, CEO and co-founder of Yello, a talent-acquisition-software provider based in Chicago, says that with low unemployment and a record number of open jobs, employers need to address the talent shortage to stay competitive. He explains that most potential candidates are employed and the best candidates often don’t apply, so organizations can’t rely on the “post-and-pray” approach. Rather, they need to interact with passive talent—the people not job searching—to develop relationships. Enter talent communities, an approach that will no doubt be touched on at the Recruiting Trends & Talent Tech Conference next February. “Talent communities enable employers to cultivate pools of passive candidates, engage talent through compelling content and tap these pipelines for future roles,” Weingarten says. A talent-community success story has been percolating at Chester, Pa.-based Power Home Remodeling, the largest exterior home-remodeling company in the country, with $520 million in annual revenue. According to Vince DeVine, who heads talent acquisition at Power, the company takes a multifaceted approach to building talent communities, including some typical (job-board postings and career fairs) and some unconventional (proactive sourcing and cold calling). But, DeVine says, Power’s most treasured talent community is built through employee referrals. According to Minneapolis-based Joe Ungemah, North America practice leader of talent management and organizational alignment at Willis Towers Watson, the talent-community concept is not new (he first encountered it a decade ago), but it is effective. However, precisely defining it can be a challenge. Most of all, he says, employers should not over-engineer talent communities, especially in organizations whose employees enjoy the culture and are ambassadors for the organization. West Monroe’s Sparling says her recruiting team leverages talent pools both within its applicant-tracking system and in “project folders” within LinkedIn to build pipelines of talent communities with specific expertise. “We tap into these existing talent communities before going out into the market at the start of a new search and leverage marketing campaigns to stay engaged with previous applicants, encouraging them to follow us on social sites including Twitter, Instagram and Facebook, as well as our LinkedIn company page and targeted landing pages,” she says. Sparling adds that it’s critical to both recruit from an existing network while also building out that network to look for the best-fitting talent for each opportunity, noting that having a balance of candidates will ensure the best options are brought to the table in each search. “While we are unable to specifically tie our increase in applicant engagement and conversion of new hires to any one initiative, our talent-community strategy has helped decrease our time-to-fill and increased our applicant volume and quality of applicants,” she says. Ilysa Raphael, vice president of marketing and a senior hiring leader at Power, which has approximately 2,500 employees nationwide (representing a 1,500 percent growth rate over the past decade), says the company is deeply committed to promoting from within, apart from its effective employee-referral system. “Almost all employees that work here started at entry level, myself and Vince [DeVine] included,” she says, noting that many Power employees, for example, joined the company in junior sales positions but ended up in leadership-operations roles. Along those lines, Willis Towers Watson’s Ungemah mentions recently working with a financial-services client that benefits from an “incredible amount” of employee referrals. The client in question has been measuring the trend for a long time, and many of the people who come to work for the company already have a connection within the organization. With that, the questions HR faced were: Should the program be formalized? Should there be rewards? Is there something needed to make sure that the strategy doesn’t go off the rails? Ungemah and his client decided the answer was no in all three cases. In fact, he says, adding a monetary incentive actually could cheapen the referral in some way. Rather, a lunch with referring employees or a reward that benefits both the new hire and the referring employee might be a good idea. Yello’s Weingarten notes that talent communities are effective pipeline-building tools across a range of business sizes. For example, at Yello, a fast-growing company of 200 employees, the firm’s talent-acquisition teams leverage talent communities to keep in touch with candidates they meet at local events, past applicants and final-round candidates who weren’t selected for a role. 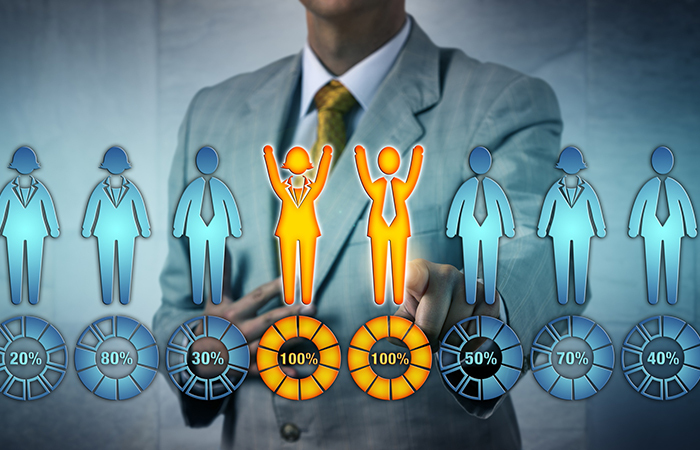 For its large enterprise clients, talent communities offer the opportunity to segment audiences and reach specific groups, Weingarten explains, adding that many Yello clients develop unique talent communities for position type or experience level. These differentiated talent communities enable organizations to communicate with valuable, personalized content, leading to engaged candidates who are more likely to convert to quality hires. “Our clients in almost every industry incorporate talent communities into their recruitment strategies,” he says. In some industries, like retail or manufacturing, Weingarten says, it can be challenging to engage potential candidates who aren’t often behind a desk or at a computer. Yello clients communicate with these candidates through text messages. So, for example, by texting the entire talent community a link to a company-culture video or careers page, recruiting teams connect with candidates wherever they are, continuing to develop a pipeline of future talent. In its 2018 Recruiting Study (an annual survey of 700 students and recent graduates), Yello found that, of respondents who had already accepted a job, one in three had joined a talent community. Weingarten says that, as employers think about future generations, talent communities become even more important. The study found that those 22 and younger were 27 percent more likely to join a company’s talent community than were those 23 and older. Weingarten frequently hears from executives that future pipeline building is a major challenge. In fact, according to PwC’s 21st CEO Survey, 80 percent of CEOs are worried about finding and hiring employees with the key skills they need. Talent communities, he explains, can help organizations bridge this gap. Weingarten advises that sharing relevant content is essential. With that, beyond open job roles, organizations should share company news, product updates, awards and accolades, employee spotlights, department highlights and more to give candidates a glimpse inside the company and its culture. “Regular, personalized engagement transforms a talent community into a valuable pipeline of talent,” he says. Weingarten says that, over time, talent communities save organizations time and money, and produce tremendous ROI. He says one Yello client, a high-growth global employer, built a talent community of 20,000 candidates and increased application volume from 3,000 to more than 50,000 in less than 18 months, even with a small team. Paid family leave of all types increased significantly between 2016 and 2018. A new report finds a record number of employers plan to increase their headcount due to automation. Timothy Tanis, drawing from his statistical analysis skills, is playing a key role in changing the way Safelite Group goes about addressing technician pay.